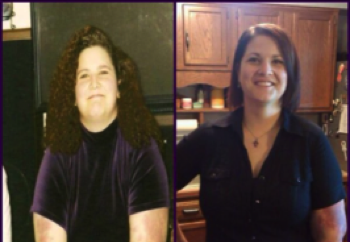 Larksong9 has lost 55 pounds thanks largely to a mindset change, new eating habits and incorporating daily exercise. The biggest change for her was her mental attitude which involved finding her “authentic self”. I have been overweight my whole life and have never really tried to lose weight even though I always said I was going to. I would always say I’ll start on Monday and by Wednesday I was done. Last year I was at a conference with a friend and we were in the swimming pool and both of us felt terrible about the way we looked. I had just turned 36 and again every year I say this will be the year I do it. My weight pattern is gain 10 pounds keep it for 5 years, gain another and so on. And I just felt that I was about ready to put on more weight and couldn’t stand it. So as my friend and I talked I said “I have to lose weight now or never speak of it again!” And 2 weeks later I started counting calories. I have never really committed to losing weight. A few years ago I did start keeping track of my calories and found that I lost some weight, but it was a bad time of year to start because the holidays were right around the corner. I got to 12 pounds and then the Halloween candy hit the shelves and it was over. I changed so much. I knew that counting calories worked for me, but I had to decide I was going to be patient with however long it took and I would do it. I refused to call it a diet and decided that the food I was going to eat was not going to be diet food, but regular food in moderation and I had to know what the calories were in everything. I discovered that the healthier the food was, the more I could eat of it which has helped me really make a whole lifestyle change in how I approach food. I started drinking lots and lots of water, which had a side effect that I wasn’t expecting. 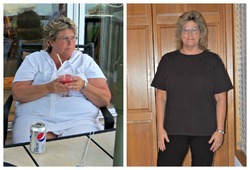 Not only did it help me lose weight, but it stopped my addiction to diet soda. I love diet soda, always have and because I only drank diet I thought I was ok. Then as I started drinking more water I began to lose my cravings for the soda! I couldn’t believe it. The other thing that was a HUGE help for me was doing some writing in the beginning about my relationship with food and being honest with how I really saw myself. It was amazing the stuff I learned from those 10 pages. Some of the realizations about what I loved about food made it easier for me to not rely on those things anymore. One of those was the fact that when I eat I love to feel so full that I am in pain. I realized how awful that sounds and that I don’t really need to feel that way. So now when I want to eat to feel that full I am able to say to myself that I don’t need to and am able to stop. I also took a spiritual approach to it. I’m a hospital chaplain and teach classes on spirituality and speak often about finding your authentic self. So I started looking at losing weight not just about getting skinny but discovering who my authentic self is and knew that my mind’s eye does not see me as fat and so I need to have my physical body match what my inner self sees for me to be authentic. Calorie Count was a life saver. I discovered it during week two when I kept going online and doing a Google search on calorie counts for certain foods and Calorie Count came up most of the time. I started looking around the site and realized how many great tools it has. 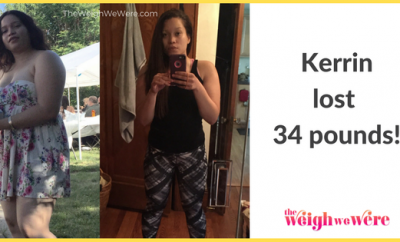 I did not want to join a weight loss group because I know that I would have rebelled against it, but CC helped me with accountability and it was so much fun going on every day, logging my weight loss and seeing the line go down! I started my morning at work by logging in and then keeping CC up all day so I would always be reminded of how much I had eaten all day and if I ate a bite of chocolate I had to log it. I would have never been able to hold myself as accountable as I did without CC! And now when people ask me about losing weight I always tell them about CC! I hate, hate, hate to exercise! So getting over that has been hard. One thing that helped was that I had a 4 month puppy when I started so I had him to make me feel guilty if I didn’t go for a walk. I honestly didn’t feel that there were too many difficulties once I started. There were plenty of times that I gained a couple of pounds like over the holidays, but I did not use that as an excuse to give up. The last 10 pounds have taken way too long for my taste, but that too I have just accepted and have kept going. I felt the results after the first 10 pounds and started seeing them in myself at 15 and others started noticing at 25. I had goals along the way. The first one was to not have to wear a slimming body suit under my clothes all the time. When I felt I could put on a shirt and not feel the fat roles from my side on my arms anymore I knew I could throw them all out! I also had an amazing moment when one day I was walking down the street and walked past a picture window and saw my reflection and the person I saw in the window was the same person I saw in my mind’s eye! That was when I knew I was successful and there is no way I am going back! 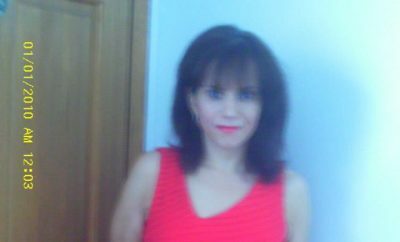 So far I am maintaining because I lost the weight eating the foods I wanted to eat and doing that by deciding I want to eat healthy food. I am still eating those foods because I love them. I am also not hard on myself when I have days that have more calories than I should have. They don’t happen every day or even every week anymore, so I give myself some grace which helps me not feel guilty which makes me want to eat more. I feel so much better about myself physically, emotionally and spiritually. I have a new wardrobe (because I had never been skinny so didn’t have any skinny clothes) which is so much fun I can’t stand it. 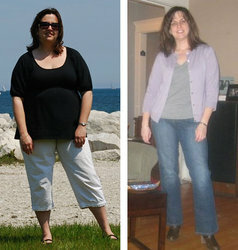 I have a lot more energy and I have been able to use my story as an inspiration for others to lose weight. I am just getting to my goal, but I already have a plan for maintaining by continuing to eat the same way I have been for the last year. Be patient! Don’t expect to lose it all in a week. Let the process take as long as it needs to. Don’t feel guilty and give up, losing weight takes longer than you think it should. Set small goals along the way. Like a goal every 10 pounds, or fitting into a pair of pants again or not feeling the fat roles on your arms anymore. Eat foods during the journey that you will still want to eat after you have met your goals. Don’t set yourself up to start eating cheeseburgers again as soon as you are done. Make it a rest-of-your-lifestyle change! Write and reflect on your relationship with food and being fat. Be completely honest with yourself. What has it meant to you, how has food “helped” you in the past and what are you willing to give up in that relationship. Knowing your true feelings about yourself and food will help you weed out the things about food that are keeping you fat.